Nutty, are you still the Right to Ride Officer? I think you should do a press release. I would, except I represent FoE and Martin McNeill would butcher or censor anything I wrote. He and I go back a long way. The point that needs to be made is that Anna Waite cannot keep going around telling the untruth that the Council's schemes are supported by cyclists and that £3million, which could have been spent on something useful, has just been pissed up the wall.. If you like, I could write something and pass it to you for approval. Yes I am still the insomniac suffering RTR. I am considering my options. Now if you look at the Cabinet minutes I linked to in the OP there was a scrutiny comment on there. 3. That it be noted that there are two other major cycling infrastructure projects (NCN Route 16 link (Cinder Path) and Prittle Brook Greenway) which are not part of the Cycling Demonstration Town project and are being pursued in parallel to this initiative. 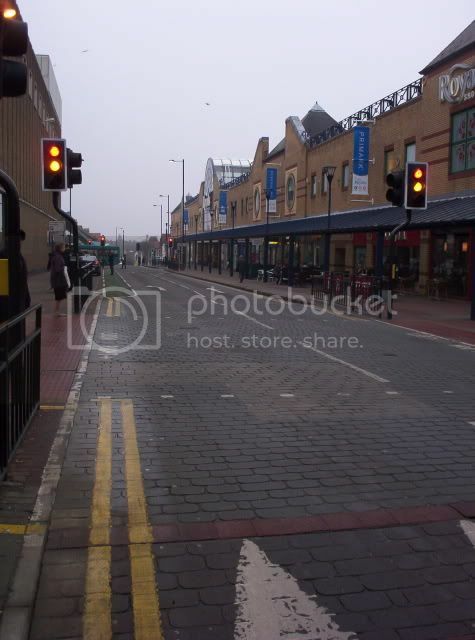 3.1 A report was presented to Cabinet on 4th November 2008, setting out the Cycling Strategy for Southend. The implementation of cycle routes is now proceeding apace and there is a need to consider adjustments to traffic regulations including footpath conversion orders (including Prittle Brook Greenway, Cinder Path, FP111 Hospital path link and FP46 Station Road to Elmsleigh Drive link) in order to meet the construction and funding deadlines up to March 2011. I've just been out for a lunch break. Fatters was understating the danger here!!!!!! This is the new cycle lane & ASL I have serious issues with. I stopped with a camera on my way in to work this morning. View along the one way Alexandra Street. And heading south towards the junction? It's a tight t-junction with only a left turn option. 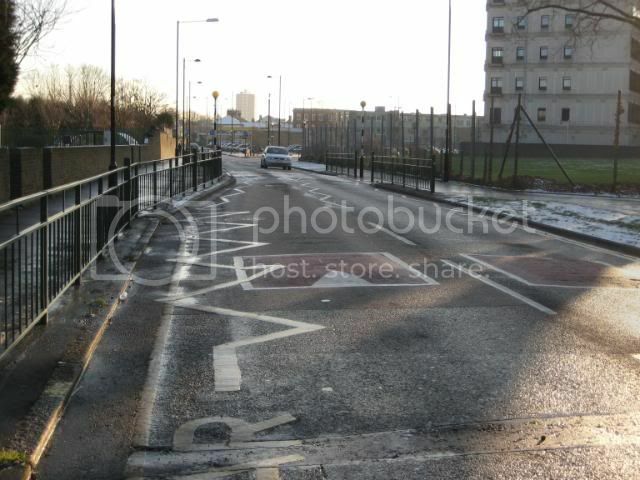 No cyclist should be to the left of traffic here as there is a real risk of collision on the apex of the bend. That should have a sign in it, "Suicidal Cyclists Queue Here". There's no vibrations, but wait. I train my trainees to take the lane and go over the bumps. Yes they are annoying to cycle over but I would rather have that than a bus/car/van/etc squeezing by. I generally cycle to the right of of the bump. On this one I always do. And on this one I keep to the right of the bollard. 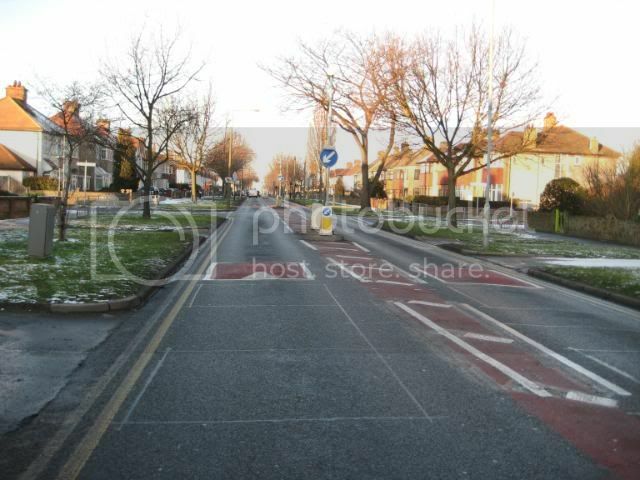 If you'd seen the plans for this hump, and the whole of the road, at consultation time would you have been happy for the hump to have been sited there, or would you have commented that it prevented the cyclist from taking the lane and requesting that a different solution be found. 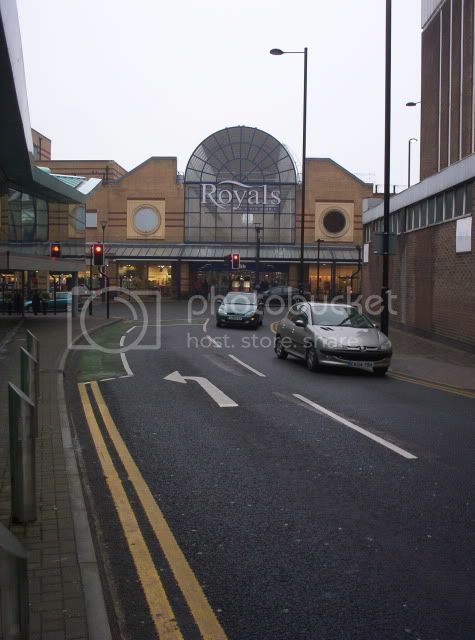 1) re-site the bump further away from the bollard. If you had responded with 1, 2 or 3, would you have been happy to see the final construction matched the draft consultation plans? I have just been out for a ride along the seafront Westcliff-Shoebury direction with my other half to test out his new IQ cyo light. We stayed off the cycle path and rode on the road. I have to say that in Southend it seems to me you always get one comment or toot from a box driver, but tonight in three miles of riding we had two blasts of the horn, one passenger leaning out of window to tell us where the cycle path was and one driver who did the same after lowering the passenger side window. 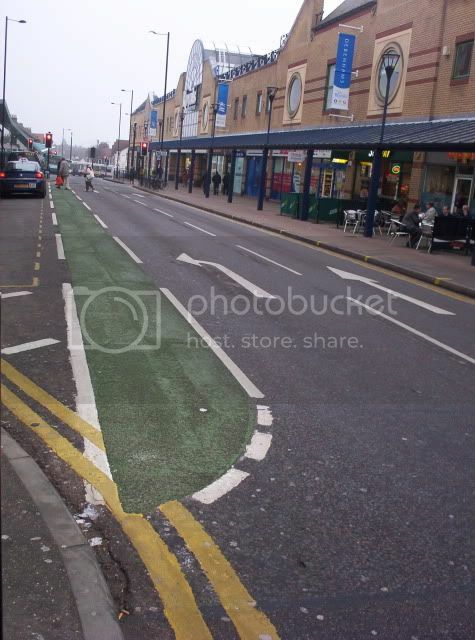 Is there an anti cycling culture brewing in Southend, Tbh tonight has shocked me a bit. Yes there is. It starts in the Civic Centre! I've found it seems to ebb and wane, and I don't know why. If I get a comment from a car, I know it's a bad week. I've had stuff shouted at me Monday night (and the back seat passenger take a photo), and another passenger shouted out of the window last night (Tuesday). I also got hit later on Tuesday night*. I didn't ride home tonight as I got the train** to Basildon for a cycle meeting with Essex County Council. I've had a couple of bad morning commutes too. ** Southend to Basildon cost me £5.20. It saved me 9 minutes on a door to door cycle journey. I think I should have cycled the whole way as that's not value for money. The only good thing amongst the misbehaving school yobs was the girl fooling around trying to make me laugh who said "look, you're getting on this man's nerves and all I'm trying to do is give him a good time" - and then who went absolutely bright red as she realised the innuendo behind her comment. That's one of the worst sections of road in town to ignore the farcilities. 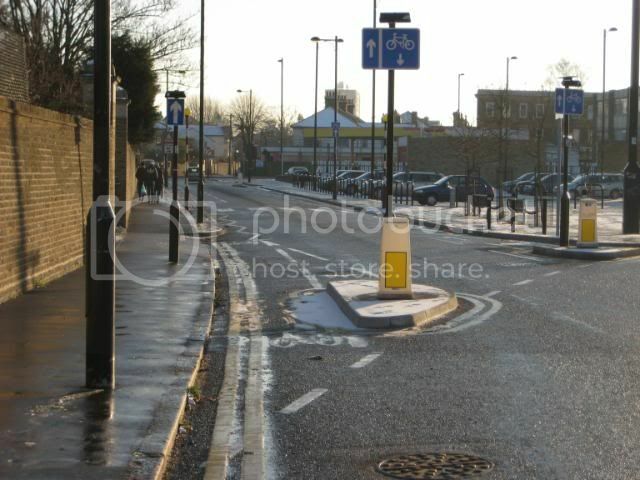 If you're not on that cycle path* then you will get abuse. 3) not being able to use the path as it's used as a service road by the council bin emptying vans. I agree with him on all these points. The best time I had down there was a summer's lunchbreak with a tail wind. The path was full of kids on stabilisers. Even though I'd caught the queue up and was looking for the overtake the passengers in the car were angrily gesturing at the path. i shook my head, overtook, and left them for dust stuck behind the learner. That was 5 years ago. The only way we'll improve matters is to get rid of dedicated paths alongside 30mph roads and head back towards a shared space. Unfortunately it seems to me that the local council are once again pursuing a regime of getting cyclists off of the carriageway and away from anywhere that they might cause delay to the motor car.